Summary: Maisie Danger Brown just wanted to get away from home for a bit, see something new. She never intended to fall in love. And she never imagined stumbling into a frightening plot that kills her friends and just might kill her, too. A plot that is already changing life on Earth as we know it. There’s no going back. She is the only thing standing between danger and annihilation. It starts out slow, with the introduction of the heroine Maisie Danger Brown and her incredibly lovable parents. Her mother is from Paraguay and her father is a hopeless jokester. The two home-school Maisie, who dreams of being the first one-armed astronaut in outer space. Her partner in genius nerdiness is her best friend and fellow home-schooler Luther. Maisie’s relationship with her family and friends was incredibly heartwarming to read. Though the romance and plot twists teetered on the inexplicable side at times, the snappy dialogue and fast paced story more than made up for it. **Though I couldn’t help but get incredibly skeeved out by the guy who’s all “hey foxy Latina~” at Maisie. Sadly, my ship did not sail, though it was good and seaworthy. Oh geez, I picked this one up and totally got hooked into the first few chapters before reminding myself that I have other books to get to in my TBR! Intrigued to see how it handles those themes, because those can make or break a book for me, I find. Also, I already ship Luther + Maisie, but that ship is doomed to sink, isn’t it? :S A wee bit worried about the pick-up lines, now. It’s definitely a book that hooks you in! 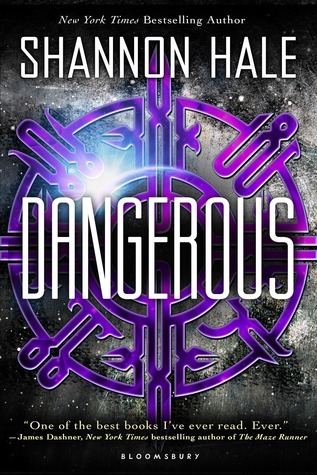 Dangerous raises a lot of interesting moral dilemmas, but I have mixed feelings about how they were handled (and don’t get me started on Wilder’s pick-up lines…). Hope you like the book!